If you really 'need' a new Kaweco and you're looking for some really nice colors, these may be something for you. 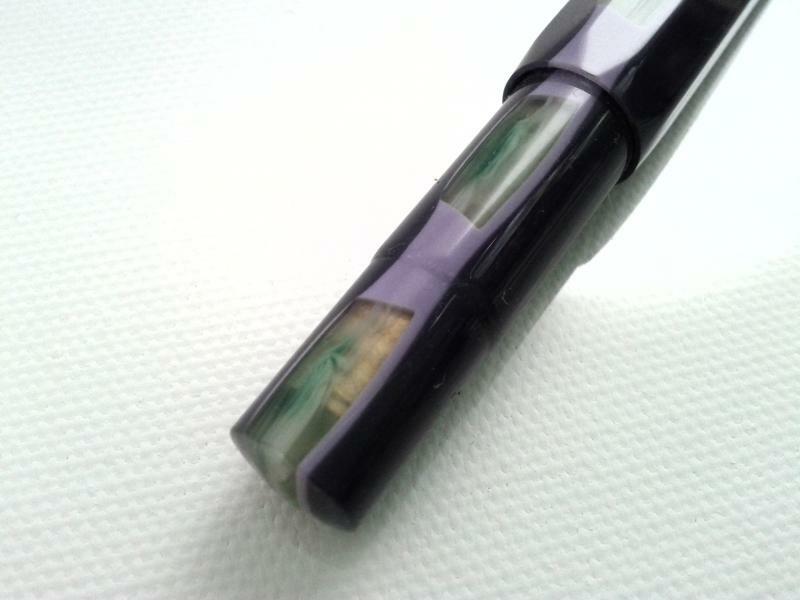 The Kaweco Art is made out of acrylic bars and hand polished. The same size as the classic or AL sports and available in 8 different colors. Amber is really nice, What is the weight? Edited by FrankvK, 11 October 2013 - 17:40. The one I used to own wasn't finished very well inside the barrel. Mine also had a weight placed in the end of the barrel. I don't have mine anymore though. Now I have three! Just added the amber to my lapis and amethyst. However... research on the web shows what looks like a previous generation of art sports; Samba, Tango, Blues, and Mambo. I've never seen them in the shops or on ebay, so ... what happened to them? That's a beautiful looking pen. I think Kaweco Sports are great pens. Thank you. I like my Kaweco pens too. I think I have 5 of them now. I just got a sport fountain pen with pencil. I have spent an age trying to fill it with the converter. More ink on hands than in converter. Followed instructions I found on a website to so a drop ink in converter!! Anyone got a solution as it is very disapointing. Dinkie, I had exactly the same problem when I decided to try the converter a few days ago. I'd previously been using cartridges only. After a frustrating episode of inky fingers, I've come to the conclusion that the only way to get the converter filled is to use an ink syringe. It's quick and no mess to clean except flushing out the syringe. It does defeat the purpose of having the converter since cartridges can be filled the same way, but it's a workaround. The converter I have is the one that has a metal guard, but I know that Kaweco released a newer version that's like a sac filler. It omits the metal guard so you can pretty much get all the air out of the converter at once. This means that theoretically, more ink get sucked in the converter instead of a measly drop. 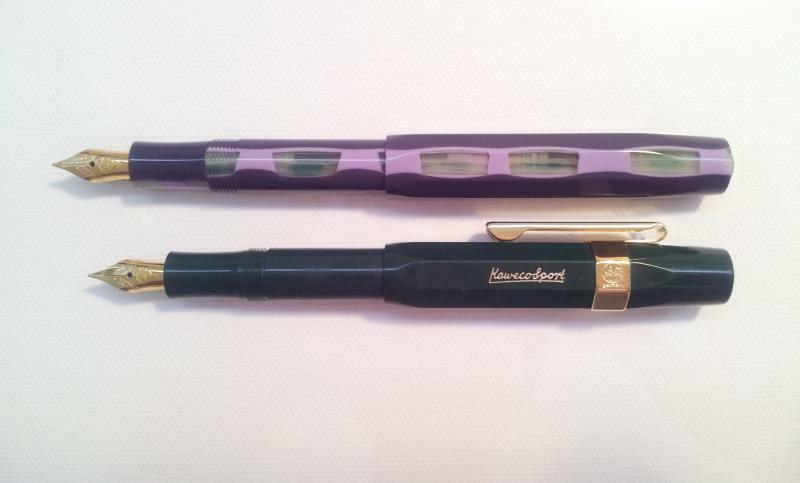 Amk, I was lucky enough to be able to purchase one of the older (and I believe first) generation Kaweco Art Sports at a pen show last year. Prior to that I'd been looking online and had found the older generation to be more appealing, but alas nobody seemed to sell them. Therefore I consider myself to be extremely lucky to have chanced upon one. The seller at the table was a Kaweco dealer and said that the pen had been in his possession since it was released. 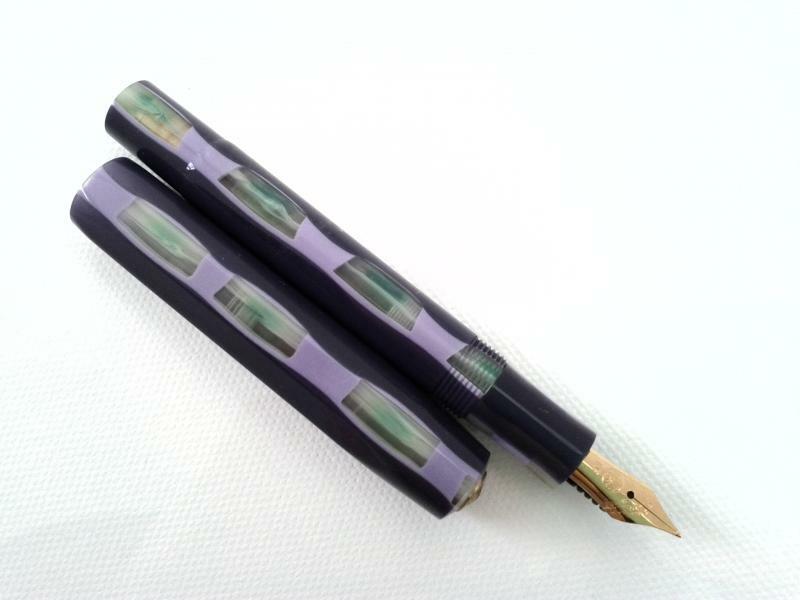 The pen is a dusty purple with rectangles of mint green. It's CNC milled out of a solid block of acrylic then polished. Closed length is 10.5cm, open length (capped) is 13.5cm. 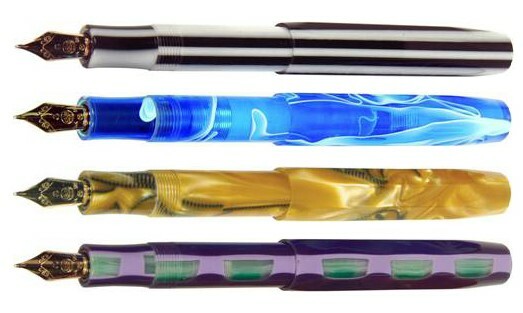 According to the Kaweco website, the name of this particular pattern is called Samba. It is part of the first generation of Art Sports released in 2003. There were four colours, but only Samba is currently present on the the Kaweco website. The picture below shows the original colours/patterns. (Credits to whoever took this picture) I can't be sure of what the names are since Googling has come up with inconsistent names. Unlike the current generation of Art Sports, this has a weight at the end of the pen. It supposed to make the pen feel more balanced in the hand and I like it! The position of the weight has it resting just above the middle of my thumb and pointer finger so it doesn't pull my hand back but adds a pleasant heft. Not top heavy at all. Since the part of the acrylic material is transparent, the weight is visible. If you look at the picture it's the brassy looking thing. I find it slightly detracts from the pen but at least it cannot be seen with the cap posted. The pen was mounted with a fine nib but I requested an extra-fine nib, which the seller willing swapped by pulling out the nib/feed unit. 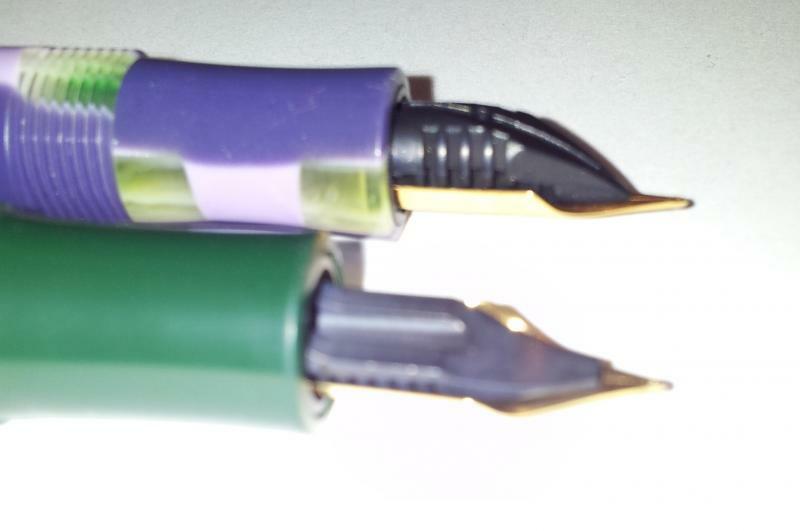 I'm not sure that the nib/feed can be pulled out like that with the regular Kaweco Sports, but please inform me if I am mistaken. A few other differences I've noticed is that the feed is different to the regular Sport, and that the converter wont fit in to it. With the Art Sport feed the underside is convex with prominent channels at the side, where as the regular sport is concave with very much hidden channels. I've tried my best to take a picture here, please excuse the lack of focus. As for the Kaweco converter incompatibility, I've found that the metal bit before the opening of the converter makes it slightly too wide. 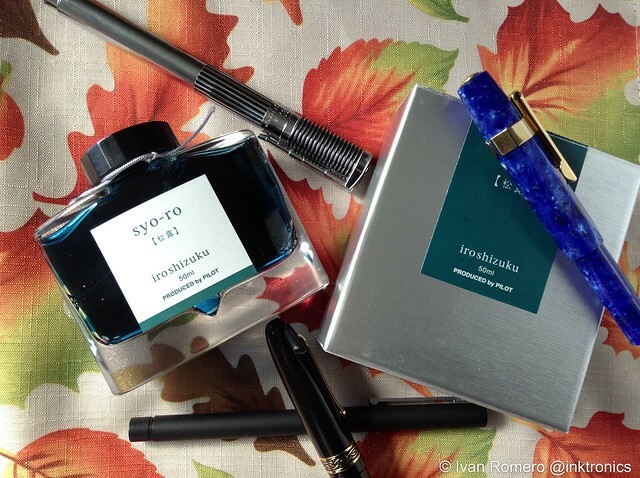 I would post a picture demonstrating this, but my converter is being used in another Kaweco Sport. I'm not sure whether this would be an issue for the new generation of Art Sports since I can only speak from my personal experience. I have also not tried the new converter but I imagine that the same issue would exist since the metal bit is still there up near the opening. This is the box my pen came in. (Yes that's me in the reflection, oops!) As far as I know, this is probably not the original box since I've seen online that that the current Art Sport comes in a very distinct black square box with a leaflet, etc. Nonetheless I really like this box and is certainly an upgrade from the economical cardboard box that my regular Sports came in. I own three Kaweco Sports and this is by far my favourite! Edited by Ayami_109, 28 October 2014 - 07:13. In your last picture of the Samba posted it looks like it posts longer than the regular Sports. Is that correct or just an illusion from the photo? It is not an illusion. The Art Sport is longer. Capped the Art is slightly longer than the Classic by about 2mm or so. Uncapped the Art is approximately 140mm, the Classic 132mm. It depends how firmly you post. I find my EDC Classic Sport posts slightly deeper than my newly purchased Skyline Sport. That really is a pretty pen! I have been wanting to get one of these pens but have never seen them on sale. They are much prettier than the normal Sports. I know that Fontoplumo sells the current Art Sports. 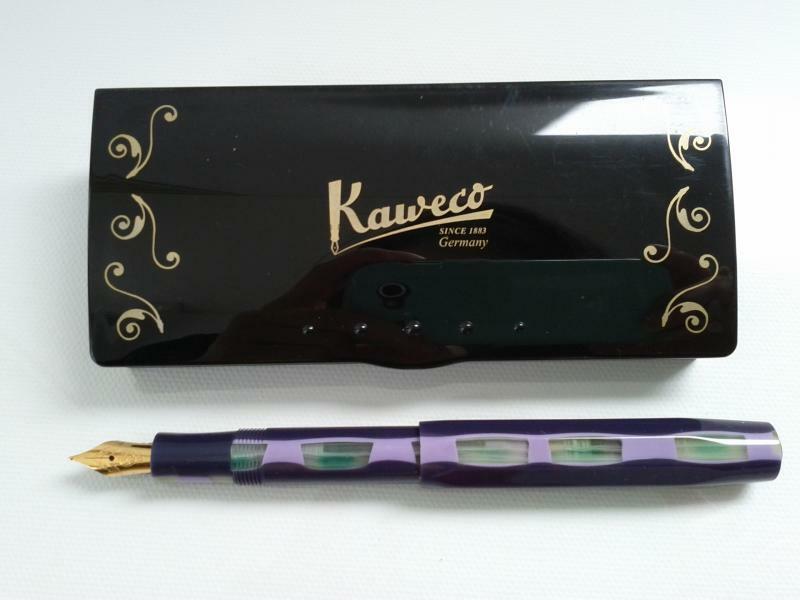 They sell the biggest selection of Kaweco stuff I've seen online. I bought my Skyline Sport from them recently and they're pleasant to deal with. Shipping rate was reasonable and it arrived from the Netherlands to my doorstep in record time!